A parameter of multimode optical fibers. It represents the diameter of the circle that best approximates the circumference of the core region. The smaller the value of the core diameter, the broader the services band. Fibers commonly used today have a core diameter of 50µm. A parameter of single-mode optical fibers, MFD corresponds to the diameter of the spread of electric field distribution in propagation mode (light path). Light usually passes through the core region. However, in the case of a single-mode optical fiber, the light leaks into the cladding region. Therefore, single-mode optical fibers are specified by MFD rather than core diameter. MFD is slightly greater than the core diameter. The smaller the MFD, the higher the required accuracy of alignment for connection/splicing. Furthermore, the larger the MFD difference of two joined fibers, the greater the connector/splice loss. The diameter of the circle best approximating the cladding surfaces. The larger the cladding diameter difference of two joined fibers, the greater the connector/splice loss. A parameter of single-mode optical fibers. 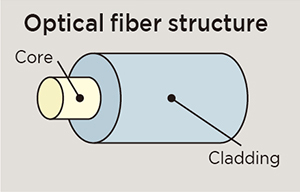 An optical fiber cannot be a single-mode fiber if it is used at a wavelength shorter than the cable cutoff wavelength, which is determined by optical fiber structure, involving refraction index distribution and core diameter. 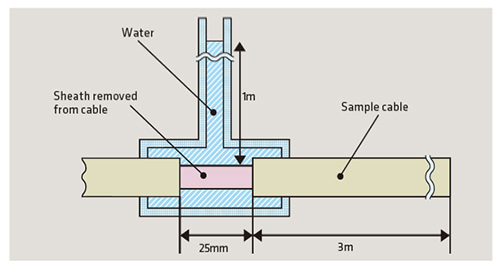 Screening is a technique intended to remove the glass defects of a fiber and improve its structural reliability. A given level of elongation strain is applied to the overall length of an optical fiber to break the fiber at its low-strength section. The screening level is the value of the elongation strain. The higher the value of screening level, the higher the reliability of the optical fiber. The transmission distance becomes short when transmission loss grows. A parameter of multi-mode optical fibers. The transmission band is the frequency at which the magnitude of the baseband transfer function decreases to a specified value (6 dB). In other words, the value indicates to what frequency the signal is transmitted without distortion. The higher the transmission band, the higher the usable transmission frequency, hence larger-capacity transmission. A parameter of single-mode optical fibers. At the zero-dispersion wavelength, the wavelength dispersion decreases to zero. Transmission at a wavelength of a large absolute value of wavelength dispersion results in greater dispersion and therefore higher optical pulse distortion. Optical fibers designed so that the zero-dispersion wavelength is about 1310 nm or 1550 nm are known as the general-purpose SM or the dispersion-shifted optical fiber, respectively. A parameter of single-mode optical fibers. The zero-dispersion slope represents the gradient of dispersion at the zero-dispersion wavelength. In general, the greater the zero-dispersion slope, the higher the absolute value of dispersion at any wavelength. The maximum tension means that an optical cable is allowed to undergo during installation. It should be remembered that the maximum permissible tension does not mean the cable is capable of sustaining the tension constantly after installation. The maximum radius is defined that a fiber-optic cable can be bent. The maximum permissible bending radius applicable during installation differs from that applicable after installation. In general, when a fiber-optic cable is installed, maximum permissible bending radius is about 20 times the cable outside diameter. After installation, it is about 10 times the cable outside diameter. The operating temperature range shows suitable environment for fiber-optic cable installation. In general, the operating temperature range of a cable designed for outdoor use is within -20 to +60°C. With a cable designed for indoor use, this range is about -10 to +40°C. In general, fiber-optic cables installed underground are required to be waterproof. While various test methods are used, Sumitomo Electric adapts the method shown below. Optical loss from one of two joined fibers to the other. The connector loss is expressed by the following equation. The greater this value, the larger the optical power decrease, hence the shorter the transmission distance. The ratio expressed in decibels of the power of the light entering a connector to the power of the light reflected from the connected end face. The return loss is expressed, as follows. The higher the value, the weaker the power of reflected light, hence the lower the noise level. The connection characteristics of a connector differ depending on the ferrule polishing method adopted. In general, optical termination / junction boxes and closures are required to be protected from foreign matter and water leaks (principally for outdoor applications). IP codes specified in JIS C 0920 or IEC 60529 are used to indicate protection classes. IP3X : Protected against foreign matter of 2.5 mm diameter and greater. Protection against water not specified. IPX7 : Protection against foreign matter not specified. Protected against the effects of temporary immersion in water.